Until 1996 the number of psychiatrists working in private practice and making a living from the practice of psychotherapy was rather high. This can be explained by a number of factors. The separation of psychiatry from neuropsychiatry has led to the multiplication of psychiatrists in private practice. Indeed, it was not necessary to carry the title of neuropsychiatrist to become ‘médecin des hôpitaux psychiatriques’ (doctor of the psychiatric hospitals). Thus, the ‘alienists’—or head doctors of the asylums, carefully renamed ‘médicins des asiles’ (doctors of the asylums)—were doctors mainly interested in the description of the disturbances they observed or in their classification. During the Second World War the first reflexion on community psychiatry was under way: the specialists of the public services realized that they were not doctors employed to watch over big concentrations of chronic patients that the city needed to protect itself from. Also, because of the inevitable chronicity of their mental disorders, these patients, after having been submitted to inefficient treatments, had to finish their lives in the hospital, where they were confined and watched over while doing menial jobs without pay. After the war most new psychiatrists were interested in psychoanalysis and many of them became psychoanalysts. Many were deeply interested in child psychiatry and this led to the creation of new services, built upon the model of the Anglo-Saxon guidance centres, with teams of psychiatrists, psychologists and social workers joined by speech specialists, motricity specialists, and so forth. The psychiatrists thus learned that disturbances in the child appeared as the alarm signal of a family malaise, that they could have a transitory character and that, despite their resemblance with certain disturbances in young adults, they could appear as normal symptoms of development—this is how the transition was made to the realm of neurosis and of reactive disorders, which suppose the psychosocial help offered to parents and which are, in fact, directly inspired by the study of family conflicts born with the oedipal situation. It is in such cases that psychoanalytic psychotherapy applied to children was first largely applied in centres, the first of which were created after the Second World War and were called ‘centres médico-psycho-pédagogiques’ (medical-psychological-pedagogical centres). In these circumstances, and from 1960, the government recommended the creation of psychiatric community centres (secteurs de psychiatrie) for children and for adults. These were reserved for a fixed number of people. Their aim was to ensure continuity of care and unicity of treatment. It was also planned that the number of hospital beds would be reduced for the benefit of lighter psychiatric services. The participation of the family in this care project was largely required. The first experience of this type, which was to be conceived as the French model of community psychiatry, was created in Paris in the 13th arrondissement under the direction of Philippe Paumelle and myself. Psychiatry reserved for adults was coordinated by an outpatient clinic (presently the Philippe Paumelle centre). The adult department had a hospital which comprised only one bed per 1000 inhabitants instead of the usual three beds per 1000 inhabitants. Such a reduction in the number of beds supposed the creation of lighter services—a day hospital, a night centre, a therapeutic centre, workshops, etc, and a foster-family placement service next to the hospital. The Alfred Binet Centre, meant for children and adolescents, had only a few beds available for several months. Collaboration was established with the day hospital and, later, with an evening intensive care unit. The Alfred Binet Centre also had a foster-family placement service, mainly intended for babies from families of psychotic patients, etc. Twenty years after it was created, under the direction of a private association which acted as a public service, the Association of Mental Health of the 13th arrondissement was relocated in a purpose-built building common to the two centres. The Alfred Binet Centre mainly trained child psychotherapists, who were or were not medical doctors and who worked in the centre and/ or in private practice. The team had acquired a lot of experience in the application of psychotherapy to severe conditions, mainly of a psychotic character. Also, these teams worked directly in the centres reserved for children, mainly in the schools, but soon left because of the rise of the sociocultural level of the families, which enabled the latter to collaborate with the therapeutic efforts that had been undertaken. However, this was not the case with particularly deprived families. Thus the need for network collaboration became apparent. In 1968 these pilot services became the object of many criticisms. Indeed, the ‘revolutionary’ groups protested against the ‘aristocratic’ vision that the directors had of their services. According to them, the latter neglected the most severe forms of pathology, observed in poor environments, where people could not understand the measures dictated by isolated psychoanalysts who pretended both to know and to command. It is during these years that psychiatry separated from neurology. The speciality degree of psychiatry (Certificat d’études speciales de psychiatrie) was created. It was obtained by residents in psychiatry and by students who wanted to become psychiatrists and lasted four years. It started with a ‘probatory’ year, whose aim was to weed out false vocations that were even more numerous since students who did not wish to be deeply trained in medicine felt particularly happy in this speciality. Therefore, a psychiatric ‘plethora’ ensued. To the latter corresponded the Lacanian plethora of those who pretended to be psychoanalysts. This mass was soon mixed with that of the psychologists, who also claimed to be psychoanalysts. The latter often succeeded in occupying themselves in public centres, in day hospitals, and so forth. The former, the psychiatrists, were rapidly taken up by clients who could benefit from the reimbursement of the psychotherapeutic consultations by the Social Security. This way of doing things has not been of any good to psychoanalysis—in that anything is done, including very short sessions called psychoanalysis by the ‘Lacanians’, who are known to gain their training only from themselves. This situation, very specific to France, did not really suppose controls by social security agencies. Nevertheless, it should be mentioned that a few years later the specialization in psychiatry was reserved for those who took the competitive examination in order to become a specialist, an examination common to all specialities, and who often undertook a lengthy training in psychoanalysis. Thus, at a time when the recruiting of psychiatrists is very limited, psychoanalysis is being practised in private practice by analysts for whom this is the second profession (former residents or former fellows) and the therapeutic acts of these psychiatrists are reimbursed by Social Security. Nevertheless, these specialists are not officially accepted by the Social Security system in the usual sense. Therefore, their fees are often higher than those of officially accepted doctors, whose consultations are completely reimbursed by the Social Security. Starting this year, the government, confronted with the uncontrollable deficit of the Social Security and because of France’s agreement with the European politics of Maastricht, has taken severe measures which are of great concern for the psychiatrists who are at risk of being limited to the prescription of medication—a prescription that is, in fact, codified. The total budget is determined every year by government. This cannot act in the interests of patients, despite the consultation of doctors and representatives of the Social Security. The measures taken concerning expenses always aim to reduce costs. The recourse to a specialist is necessarily required by a family doctor. This measure is very easy to understand but, concerning psychiatry, the risk is that it will not be very fruitful since the general practitioner will be suspicious when he sees his patient going elsewhere. If he is trained, he will be able to undertake a primitive and rather polymorphous kind of psychotherapy. He will be familiar with psychotropic drugs which give satisfaction to the patient without the mental pathology being amended. The consultation must include full medical notes which clearly state the diagnosis. The patient will fear disclosures of the medical confidence—a violation which may become even more frequent when, in a few years, the patient’s follow-up will become the object of a computerized version. The specialist practitioner will be afraid to initiate extended psychotherapies with several sessions. Indeed, he is warned that ‘any excess of this kind’ will be imputed to him. He will be submitted to scrutiny by the Social Security and may be forbidden to practice his profession. In fact, the psychiatrist is threatened in two ways. First, on the individual level, as we have just seen, by a reversion of the paid fees. Second, by a collective sanction imposed on the profession—it is planned that if the expenses of a speciality exceed 5 per cent of the budget, the profession collectively will have to reimburse this excess. Thus, caught in an individual straitjacket and fearing the responsibility he would be placing upon his colleagues, the psychiatrist is left with prescribing medication and sick leave—the latter, of course, in a limited amount, which seems quite fair. But his freedom to prescribe will be hindered by the measure called RMO (référence médicale opposable [opposable medical reference]). Such a measure probably prevents therapeutic fantasies, but it does impose on doctors to follow rules which result from university departments experiments and which are unfortunately remote from everyday practice. What will the future of the practice of psychotherapy be in such conditions? It will be ‘a treatment of comfort’, apart from very brief psychotherapies or behavioural-cognitivist-type psychotherapies. Such a practice has existed for many years in somatology, where the reimbursement of the prosthesis is very minimal since the Social Security is not in charge of reimbursing the ‘comfort’ of patients. These conditions lead to the fact that extended psychotherapies and, even more so, psychoanalysis confounded in a vague magma, will not be reimbursed any longer. This only accentuates the malaise concerning behaviours that are not in accordance with ethics and medical morale in relation to the training and the practice of what one calls psychoanalysis. In summary, psychiatrists and psychologists will be limited to practising their profession like fortune-tellers, which will certainly worsen the demagogy which reigns against Freud and his disciples. There is a European regulation that can avert this disaster. It is applied in principle in Italy and concerns psychotherapies where psychoanalysis could not be applied in all its strictness—for example a treatment whose length is long and unforeseeable and comprises four sessions a week lasting at least forty-five minutes, etc. Confronted with these regulations, the analytic societies take different preparatory measures. In Italy the psychoanalytic society adopts the regulations which are provided for by law and conform with the European policies. These regulations already exist in Germany, Holland and the Scandinavian countries. But, in all these countries the number of sessions is limited and the treatment usually does not last more than a year. For this reason, the discontinuation of the treatment is a disaster. It is true that, except in Germany and in Italy, psychotherapists who are not medical doctors and who are affiliated with an acknowledged society of psychotherapy benefit from the same measures as medical doctors. In England psychoanalysts are not affiliated with the National Health Service. Now they also tend to call themselves psychotherapists. 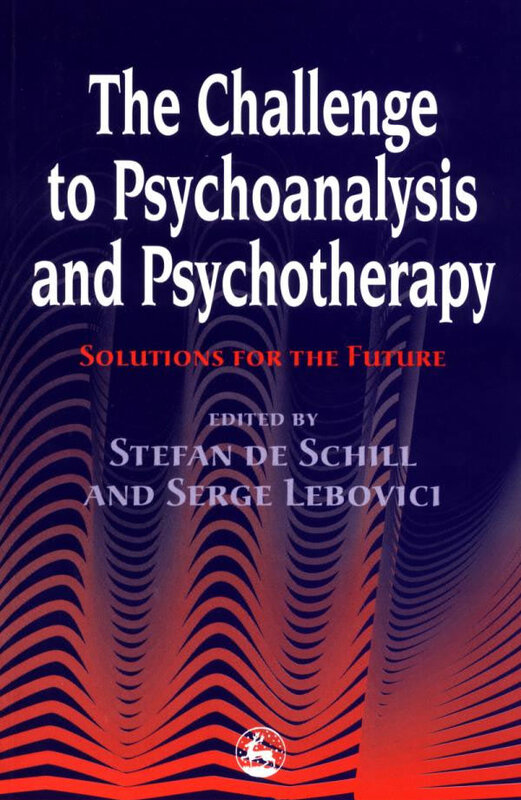 In France it is hoped that psychoanalysis will be differentiated from other psychotherapies. This is a chimerical wish and, if such a measure were discussed, it would be discussed with all the groups claiming themselves psychoanalytic groups. This would lead to a horrible confusion which the creation of an ‘Order of the Psychoanalysts’, suggested by Leclerc before he died, would obviously not resolve. All this means that belonging to the International Psychoanalytic Association (IPA) is an important recourse, particularly because any member of this association belongs to it through the Psychoanalytic Society of which he is a member but also because he remains a member of the IPA as an individual, with his own rights to vote. This infers a heavy responsibility concerning the future of psychoanalysis in the world. I deeply believe that the development of modern neuropsychology cannot replace the psychopathological approach of the different cases we have in treatment. The specialists in the field of mental health cannot be limited to putting into practice a diagnosis which is claimed to be deprived of any theoretical consideration. Also, the obligatory form-filling, designated by mysterious initials, would limit his role to that of a survey agent and the results would be generally interesting only on a purely commercial level. Bourguignon, A. (1989) L’Homme Imprevu. Paris: Presses Universitaires de France. Brody, S. (1981) ‘The concept of attachment and bonding.’ Journal of the American Psychoanalytic Association, 29, 4, 815-830.
Cooper, A. (1985) ‘Will neurology influence psychoanalysis?’. American Journal of Psychiatry, 142, 12, 1395-1402. Emde, R.N. (1981) ‘Changing Models of Infancy and the Nature of Early Development. Journal of the American Psychoanalytic Association, 29, 1, 179-220. Freud, A. (1958) ‘Child observation and prediction of development’. Psychoanal. Study of the Child, 13, 90-119. Green, A. (1979) ‘L’enfant modele’. Nouvelle Revue de Psychanalyse, 19, 27-48. Hochmann, J. and Jeannerot, D. (1989) Esprit, Oú Souffles-Tu? Paris: Odile Jacob. Joseph, D.E. and Widlöcher, D. (1983) The Identity of the Psychoanalysts. New York: International Universities Press. Kandel, E.R. (1983) ‘From metapsychology to molecular biology; explorations into the nature of anxiety’. American Journal of Psychiatry, 140, 10, 1277-1293. Kris, E. (1950) ‘Notes on the development and on some current problems of psychoanalysis’. Child Psychology, 5, 2-6. Lebovici, S. (1986) ‘Le psychanalyste et l’étude des interactions precoces’. Revue Francaise de Psychanalyse, 5. Lebovici, S. (1993) ‘From filiation to affiliation’. Infant Mental Health Journal, 14, 4, 26-72. Mahler, M. (1968) The Selected Papers of M. Mahler. New York, London: Jason Aronson. Marty, P. (1980) L’ordre Psychosomatique. Paris: Payot. Meissner, W. (1981) ‘Metapsychology: who Needs It?’ Journal of theAmerican Psychoanalytic Association, 29, 4, 921-938. Popper, K. (1935) The Logic of Scientific Discovery. London: Hutchinson. Racamier, P.C. (1983) Le Psychanalyste sans Divan, 2nd ed. Paris: Payot. Stern, D. (1992) ‘The pre-narrative envelopes’. Journal of Child Psycho-Analysis. Sulloway, F. (1981) Freud, Biologiste de L’Esprit. Paris: Fayard. Winnicott, D.W. (1965) The Maturational Process and the Facilitating Environment. New York: International Universities Press.